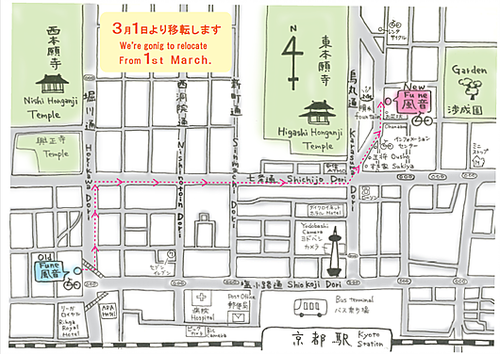 3月1日より京都駅前に移転します。We will move to our shop in front of Kyoto station at March 1st. Hello, everyone! This is Rental Bicycle Fuune. We really appreciate for you to use our bicycles! We will move to our shop in front of Kyoto station at March 1st. And this is the new map which shows the new location of us. So please make sure and come to our new shop from the beginning of March! Both of our shops are open till the end of February with our best hospitality for you. We welcome you whenever you come!